A haunting opening number asks us to “Attend the tale of Sweeney Todd,” and attend it we did, with pleasure. 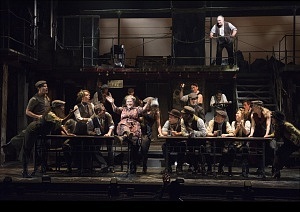 The Shaw Festival’s production of Sweeney Todd, with music and lyrics by Stephen Sondheim, book by Hugh Wheeler, and directed by Jackie Maxwell, transforms the Festival Theatre into the gritty underbelly of London, England—full of sinister characters, sleazy con artists, and one murderous barber. 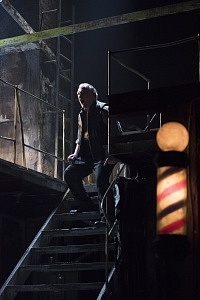 Benedict Campbell as Sweeney Todd. Photo by David Cooper. The story begins with Sweeney (Benedict Campbell) arriving back in London having been sent away for 15 years, leaving behind his wife and baby daughter. 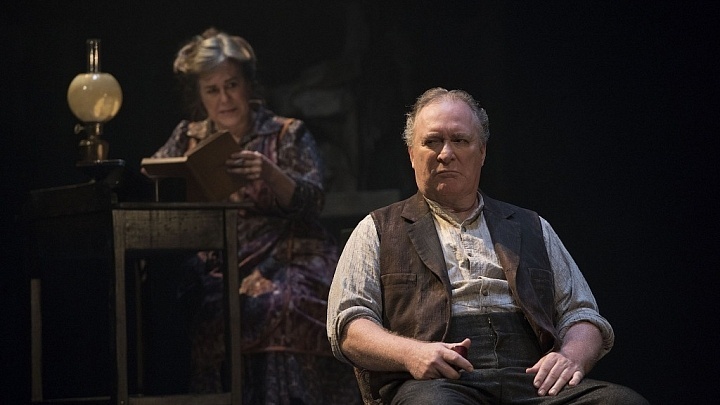 Upon his return, he runs into an old acquaintance, Mrs. Lovett, who owns a pie shop on Fleet Street, and learns that tragedy has befallen his family. Wracked with grief, he seeks revenge on the men who drove his wife to poison herself and who took his daughter Johanna (Kristi Frank). Lovett and Todd begin a new business enterprise; he as a barber, and she as an entrepreneur of sorts, with a tantalizing new ingredient to add to her pies. On the night I saw the show there were five understudies performing (I never would have guessed had I not been told!). Two standouts were Jenny L. Wright, on for Corrinne Koslo as Mrs. Lovett, and Jay Turvey as Judge Turpin (replacing Marcus Nance)—extraordinary performers who took on their roles with gusto. 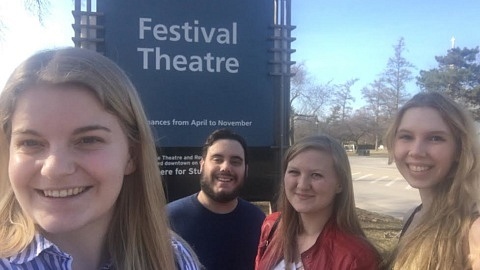 They played the villains of the piece with such cleverness and deceptiveness, it almost made me forget to hate them! Campbell, as the title character, is believable, but the music seems just outside of his vocal capability, and his acting suffers for it. Frank is beautiful as Johanna, a role that requires ultimate vocal dexterity in the upper register, while Jeff Irving as her lover Anthony shines just as brightly, portraying him with the utmost charm and passion for his lover. Adolfo Pirelli (Kyle Blair) with the ensemble . Photo by Emily Cooper. 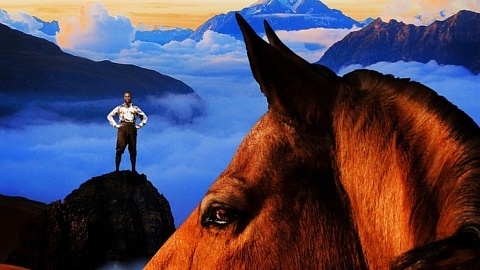 The real stars of this production, however, are the ensemble. I was totally captivated every time they were onstage, whether they were playing residents of the asylum, or simply acting as invisible observers to Sweeney’s madness (reminiscent of a Greek chorus). Their singing was pitch-perfect, and movement sequences (choreography by Valerie Moore) are done with just the right amount of energy and presence. I found myself wishing for more opportunities to get the chorus onstage, which is difficult in a musical that is so centred around its two central characters. While the show is musically strong, there were some sound issues on the night I saw it, in particular near the beginning in the balance between the orchestra and the miked performers. There were points where it was difficult to make out what was being sung because they were being drowned out by the orchestra. This took away at times from Sondheim’s raw and haunting lyrics. Mrs Lovett (Corrine Koslo) and Sweeney Todd (Benedict Campbell) a with the ensemble. Photo by Emily Cooper. The set, a two-level structure designed by Judith Bowden, gives the impression that you could probably find cockroaches nearby, and was perfect for this show. I loved the use of a grid with broken glass, used as a skylight when the setting is the shop in Fleet Street and then brought down to represent the entrance to the asylum. Since the same set is used to represent multiple locations, the blocking has the potential to be confusing for audiences not familiar with the material. However, the design team uses subtle elements to situate us, such as lighting up the barber’s pole when we are on Fleet Street. Alan Brodie’s lighting design has to be mentioned—I was blown away with how precisely it illuminates individual characters in the blink of an eye, and the use of projected light to produce coloured smoke in the finale is brilliant. 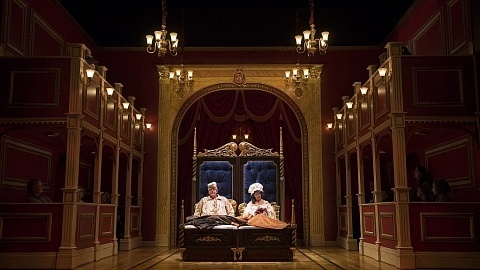 The lighting also goes a long way to distinguish between locations—making sure, for example, that the balcony where Judge Turpin and the Beadle stand at one point is not at the barber shop despite it representing that location at another point in the show. Overall this production makes for an enjoyable evening. Aesthetically, it is a feast for the eyes, but at times not quite a feast for the ears. 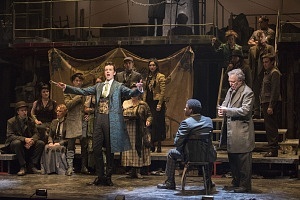 Behold the demon barber of Fleet Street in all his gory glory: you won’t find kick-lines in this production, but it’s deliciously enjoyable in its own way.